This article also appeared in the March 20 issue of Sports Weekly. I was just about to shut down my computer after the National League Tout Wars draft concluded when the thought hit me. I really like the Los Angeles Dodgers this season … I’m just a little worried they may be too good. As has been the case in several of my 2019 drafts, I have a significant stake in Dodger players as I defend my Tout Wars title. My most expensive pitcher is a $23 Walker Buehler. One of my cornerstones on offense is outfielder A.J. Pollock at $22. The two-time defending NL champions are stocked with so much talent up and down the roster, even players who can’t crack the everyday lineup or the starting rotation can be valuable fantasy contributors. 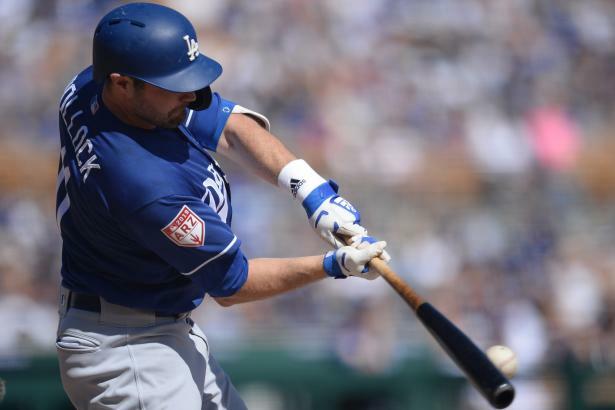 The only problem with jumping fully on board is the possibility the Dodgers may not need to lean heavily on their best players to have a successful regular season. Ace Clayton Kershaw (who went for $22) hasn’t thrown a single pitch in a spring training game as he works his way back from shoulder soreness. Buehler made his first spring start on Tuesday—a little over a week before the team’s regular season opener. It’s possible neither one will even pitch 180 innings so they’ll be fresh for the playoffs. Great for the Dodgers; not so great for fantasy owners. Perhaps with that in mind, rotation candidates Rich Hill ($13), Kenta Maeda ($12), Ross Stripling ($10) and Hyun-Jin Ryu ($8) also generated significant interest among the Tout Wars participants. And then there’s starter No. 7. Left-hander Julio Urias, 22, threw a total of 20 1/3 innings last season (majors and minors) in his comeback from shoulder surgery, but he was impressive enough when he returned in September to be included on L.A.’s postseason roster. This spring, he’s been even better. The velocity that made him a top prospect three years ago has returned. As the final full week of spring training began, he’d allowed one run and two hits with nine strikeouts in nine innings. I try not to put too much stock in spring training statistics, but sometimes they do have a subtle benefit of helping reinforce some decisions. That’s why I spent $6 on Urias to fill the final pitching spot on my roster. There’s no guarantee he pitches a significant number of innings this season – or that the Dodgers would even want him to, considering his injury history. But he seems to be at the intersection of two major themes for me in drafts this spring: the Dodgers’ overwhelming collection of talent and the wealth of young players who could be difference-makers in 2019. Perhaps more than any other draft this season, I invested in upside in this 12-team NL-only format. In addition to Urias, I spent $4 on another 22-year-old pitcher, Touki Toussaint of the Atlanta Braves. The right-hander had some control issues in his 29-inning MLB debut, but he’s done much better this spring with 17 strikeouts and two walks in 14 innings. Another young pitcher who’s turned heads this spring is right-hander Chris Paddack, 23, of the San Diego Padres. Despite only reaching Class AA last season, Paddack is making a bid to be part of the opening day rotation. He’s among the Cactus League leaders in strikeouts with 20 (to only two walks), despite throwing just 12 2/3 innings. Tossed out early in the Tout Wars auction, Paddack went to Razzball’s Grey Albright for $9 – more than veterans Kevin Gausman, Jon Lester, Alex Wood and Sonny Gray, among others. There’s a pretty good chance my success or failure this season will hinge on how these players perform. -- C Wilson Ramos, New York Mets. Are people still holding his season-ending knee injury in 2016 against him? Ramos posted career highs in batting average (.306) and on-base percentage (.358) last season, with 15 homers and 70 RBI. With such a lack of catching depth, I was stunned four others went for more than his $10 price tag in NL Tout Wars. -- C Francisco Mejia, San Diego Padres. His defense needs work, but the rookie has so much upside on offense. A .293 hitter in six minor-league seasons, the 23-year-old will split time with Austin Hedges in San Diego. -- 1B Joey Votto, Cincinnati Reds. I’m betting last year’s 9.5% home run-to-fly-ball rate (nearly half his career average) is more a fluke than it is a sign he’s washed up at age 35. Votto is still a monster in leagues that use on-base percentage, as Tout Wars does, and his $29 price tag there will be a steal for me. -- 1B Justin Bour, Los Angeles Angels. It’s difficult to tell how the Angels will distribute playing time when Shohei Ohtani is healthy, but Bour needs to be in the lineup against right-handed pitchers (.354 career OBP, .499 slugging vs. RHP). -- 2B Scooter Gennett, Reds. He’s one of four players to hit at least .295 with 20 homers and 90 RBI in each of the last two seasons. The others? Nolan Arenado, J.D. Martinez and Anthony Rendon. --- SS/2B/OF Enrique Hernandez, Dodgers. His plate appearances have increased every season since he broke into the majors in 2014. Hernandez is coming off a career-best 21 homers last year and his versatility makes him an asset for any fantasy team. With 2B/SS/OF eligibility he makes for a very interesting target after round 20 (316 ADP). -- 3B/1B Max Muncy, Dodgers. Great plate discipline (.391 OBP), paired with a top-10 ranking in barrels per plate appearance last season. A younger version of Votto? -- OF A.J. Pollock, Dodgers. Hitting leadoff in this offense could result in Pollock leading the NL in runs scored. -- OF Ramon Laureano, Oakland A’s. He showed both power and speed (not to mention a dazzling throwing arm) in his 48-game debut. A full season of everyday playing time should be even more exicting. -- SP Nathan Eovaldi, Boston Red Sox. Still only 29, Eovaldi has found a home in Boston, where an elite offense will give him plenty of support. One of the game’s hardest-throwing starters (97.2 mph average fastball), his strikeout rate took a major step forward last year. -- SP Mike Foltynewicz, Braves. I’m taking the injury discount (just $12 in NL Tout Wars) and banking on another hard-thrower coming close to what he did last year. If he only misses part of April due to elbow soreness, he could still get close to 200 strikeouts. The two things missing from this list? Steals and saves. It’s been extremely difficult for me to acquire any particular players who excel in those two categories this spring. Fortunately, those are the two things that are easiest to acquire in trades during the season.